A generation of new, feature-rich hotels and resorts designed to appeal to contemporary travelers is opening in destinations across the Caribbean. The new properties range from expansive, all-inclusive resorts set along broad beachfronts to boutique hotels in intimate waterfront locations. In addition, several leading Caribbean hotels and resorts have undergone extensive renovations, adding significant new services to address today’s vacation desires. Here’s a look at the Caribbean’s top new and recently renovated hotel and resorts. The new Four Seasons Resort & Residences Anguilla offers 181 accommodations options ranging from deluxe rooms to five-bedroom villas on 35 acres of prime beachfront property overlooking Meads and Barnes bays on Anguilla’s north side. Outdoor balconies feature private plunge pools. The resort has three restaurants. Its Sea Centre private beach club offers non-motorized water sports equipment. Visit www.fourseasons.com/anguilla. Curtain Bluff, one of Antigua’s best-known properties, will undergo a six-month, $13 million renovation in 2017, closing on May 6 and reopening on Oct. 28. The renovation will include a complete overhaul of the resort entrance, dining spaces, bar, lounge and reception area. Curtain Bluff recently completed upgrades to its four signature Hulford Collection suites, with each now featuring a private infinity-edge plunge pool on terraces overlooking the sea. The resort’s Terrace Suites also underwent a complete renovation and redesign. Visit www. curtainbluff.com. Adults-only is the latest trend in the all-inclusive category and the new Warwick Paradise Island Bahamas brings the concept to Nassau’s popular Paradise Island resort district with a deluxe 250-room property that opened in October. The 12-floor resort features four dining options, two bars, a fully equipped fitness center, entertainment and activities, an onsite gift shop and a tour desk. Visit www.warwickhotels.com/paradiseisland-bahamas. The Cayman Islands hasn’t seen a major new hotel in years, but that all changed in November with the debut of the Kimpton Seafire Resort + Spa in the Seven Mile Beach resort district. The upscale 266-room resort offers unobstructed water views from nearly every guestroom. Accommodations include a premium presidential suite and private bungalows. Facilities include a state-of-the-art spa, two ocean-view pools and three restaurants. The resort also seeks to help guests live “full, balanced lives” and features yoga mats in every room, complimentary coffee and tea, hosted wine hours, in-room fitness programming and complimentary bike rentals. Visit www. seafireresortandspa.com. The 323-room Chic Punta Cana on the Dominican Republic’s Uvero Alto Beach is another of the new generation of deluxe, adults-only all-inclusives. Contemporary-style rooms have balconies and terraces, and there are swim-up suites equipped with minibars and interactive digital televisions. Large tiled bathrooms feature overhead rain showers. Select suites offer two-person tubs with massaging jets. Clients seeking a premium, villa-style experience can opt for Chic Mansion, an 11,500-square-foot house featuring six guestrooms. A hookah bar and an oxygen bar are among the facilities. Restaurants include Tagine (Moroccan fare), Pescari (ceviche and sushi), Hunter (a steakhouse) and Vespa (Italian cuisine). Visit www.chicpuntacana.com. AMResorts’ newest addition in the Caribbean is Now Onyx Punta Cana, a 502- suite, family-friendly resort on Uvero Alto beach. It opened in November with deluxe all-inclusive amenities, facilities and services, including 24-hour room and concierge service, daily refreshed minibar in rooms and suites, five pools and dedicated areas for children and teenagers. The resort’s Preferred Club offers an exclusive adults-only section. Now Onyx Punta Cana also features nine restaurants and 10 bars. Visit www. nowresorts.com/onyx. 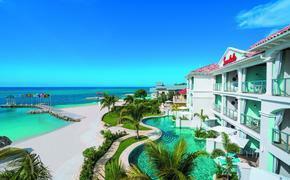 A new deluxe all-inclusive property on Arena Gorda Beach is the $140 million, 1,007-room Hotel Riu Republica. The resort, which opened its doors in June, caters to couples seeking romantic getaways. Premium drinks are served throughout, and amenities also include free Wi-Fi in all areas. The upscale property features elegant, contemporary rooms, three large pools with solarium terraces, a health and fitness center and the Renova Spa wellness center. Dining options include buffet-style international cuisine, Asian and Italian restaurants and a steakhouse. Visit www.riu.com. 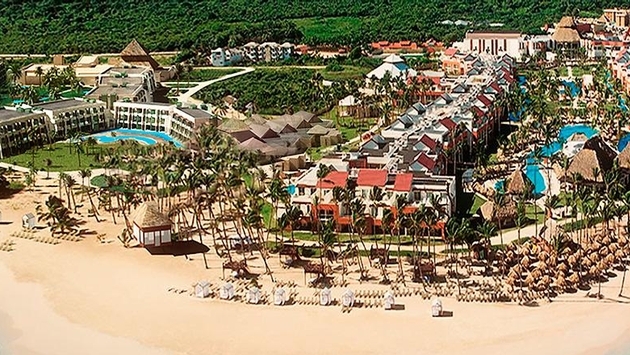 The family-friendly Luxury Bahia Principe Fantasia Don Pablo Collection debuted in November on Bavaro Beach. The 512-room property is equipped with five restaurants and six bars, including a sushi and wet bar; a fitness center featuring expansive views of the resort’s grounds; and a signature Bahia Spa offering a wide range of personalized massages, beauty and body treatments. Visit www.bahia-principe.com/en. The 600-room Royalton Negril Resort & Spa, slated to open in fall 2017, will be a contemporary all-inclusive resort designed to appeal to families with children of all ages. But the resort will also offer a special facility: The Hideaway at Royalton Negril Resort, a 166-room, adults-only all-inclusive adjacent to the Royalton Negril. Additionally, Royalton Negril Resort & Spa will offer Diamond Club accommodations in a variety of sizes, including four-bedroom oceanfront suites. Visit www. royaltonnegrilsparesort.com. A landmark Montego Bay property, Sandals Royal Caribbean, is undertaking a significant renovation via the construction of five over-the-water villas featuring see-through glass floors, over-water hammocks for two and private infinity pools. The accommodations are designed for couples. Visit www.sandals.com/main/royal/rj-home. Serenity at Coconut Bay will open in March 2017 as Saint Lucia’s new luxury adults-only, all-suite resort. Serenity at Coconut Bay will offer 36 suites ranging from 1,200 to 1,900 square feet. All suites will feature plunge pools, oversized soaking tubs and glass-enclosed rain showers in en-suite bathrooms, and custom-made mahogany king beds. Visit www.serenityatcoconutbay.com. A version of this article appears in print in the December 2016 issue of Vacation Agent Magazine.